We currently have an unfinished kitchen due to being in the middle of renovations. Despite all of this, there are days when I just must bake to keep sane! These little crispy treats are quick and easy to make, and could be made a bit more Christmassy by adding some extra bits like candy cane chunks, peppermint pieces, chocolate chunks etc. Melt butter and syrup slowly, add cocoa and mix well. 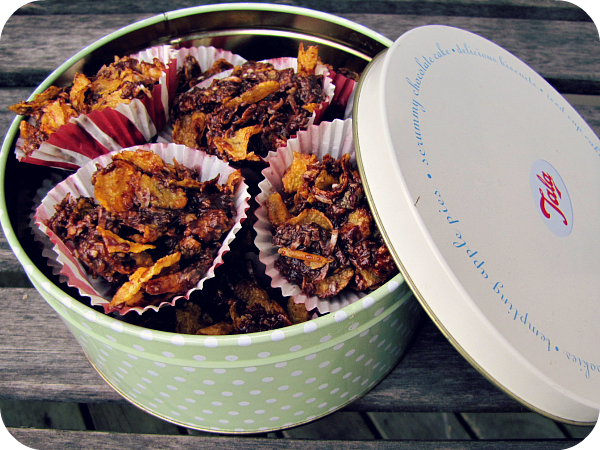 Remove from heat, stir in sugar using metal spoon, then fold in coconut and cornflakes. Stir until cornflakes are well covered. Fill paper cases and set in fridge.